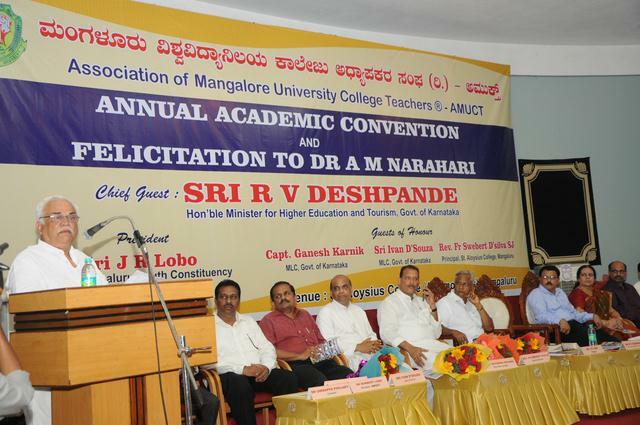 March 22, 2015 : The Association of Mangalore University College Teachers has organised a day' Convention and Felicitation to Dr A M Narahari at St Aloysius College. R V Deshpande, the minister for Higher education and Tourism felicitated former president of the AMUCT DR A M Narahari, who retired from teaching after 36 years of service. Dr Narahari is working as the Registrar of St Aloysius College for the past eight years. His wife Veena Narahari was also felicitated on this occasion. Speaking at the annual academic convention, The minister said the Higher Education department would implement sports policy and introduce sports as one of the optional subjects in higher education (from degree). The Central government is going to introduce the new education policy and the State will also introduce the policy through the Knowledge Commission. The responsibility is given to the Commission Chairman Dr Kasturirangan, he said. Deshpande claimed that in the past one-and-half-years a record number of government colleges had got NAAC accreditation. The colleges with NAAC ‘A’ grade with autonomous status can get deemed university status in 15 days. The government has started implementing technology and diploma selection has gone online. It has also started smart classes, virtual classes, tele-education etc., he added. FUCTAK former president Prof Ravindra Reshme said that in Karnataka, literary world and politicians didn’t grab the benefits of globalisation. The caste-centric politics has become a barrier to the development. The government should not have stepmotherly attitude towards aided colleges. The vice chancellors of the universities should have good relationship with degree colleges, he said.